Latin America as a region is experiencing an unprecedented period of economic growth and development which is having a direct impact on healthcare in two ways. Firstly, it has allowed the substantial growth of a middle class now capable of accessing private healthcare services. Secondly, as the majority of governments benefit from deeper pockets, greater access to healthcare products and services are demanded by the ageing and voting population, thus governments' contributions to healthcare expenditure is generally increasing. In fact, according to the World Health Organization (WHO), spending on healthcare in the region has more than doubled in the last 10 years, reaching over $350bn in 2012. As greater access strongly correlates to greater expenditure, cost-containment has been prioritised in every payer's agenda. As part of the overall healthcare budgets, pharmaceutical expenditure is the least politically sensitive target for this purpose; within these budgets, biologics account for a small portion of prescriptions yet a very high proportion of expenditure. For instance, in Brazil, biotherapeutics account for less than 3 per cent of prescription but for more than 40 per cent of the government's drug budget. Coupled with the impending patent expiry of several branded biologics, this makes the biosimilar landscape very attractive for incumbents. While biosimilars cannot provide comparative saving to generics, mainly due to their much higher development, regulatory, manufacturing and promotional costs, they still are expected to carry an average 35 per cent lower price tag than their originators. This is surely enough to gain the backing of payers, often governments, to ease their entrance into the market? In an attempt to expedite biosimilar market entry, payers are putting pressure on regulators to accelerate the registration process, but only a handful of the latter have clear pathways in place, and most are being very cautious due to safety and efficacy concerns. The pressure exerted to date has so far achieved heterogeneous outcomes, highlighting the variability within the different Latin American regulatory landscapes and markets. In this battle of savings vs safety, the momentum appears to be moving in favor of stricter regulation, meaning that the quality of clinical evidence provided by biosimilar manufacturers will make or break the opportunity in the region. With an increased expectation of pharmaceutical product safety and efficacy standards, the Latin American regulatory agencies have evolved significantly in the last decade. However, due to the poorly defined regulatory pathways for biosimilars, few companies have managed to gain marketing approval in some markets, and not without residual concerns of the quality and safety of their products from the medical community. In recent years, several of these authorities, particularly those in the most potentially lucrative markets, such as ANVISA in Brazil, COFEPRIS in Mexico or ANMAT in Argentina, have developed their own biosimilar regulatory abbreviated pathways, by merging WHO and European Medicines Agency (EMA) guidelines for biosimilars with their own political, economic and historic context. These pathways reflect a biosimilar regulatory framework which is evolving towards a more strict reality, where it is no longer possible to 'come, see and conquer' without a more robust registration dossier, which is able to demonstrate sufficient quality standards which ensure a high degree of safety and efficacy. This means the development of robust clinical data resulting from local multicenter clinical trials and a significant number of patients, with significant time and cost implications. 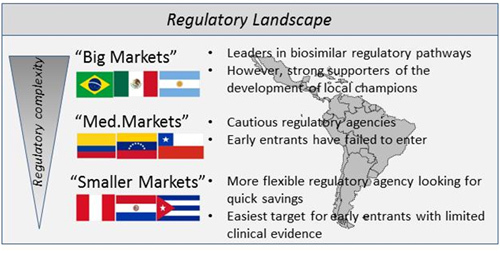 Aside from these trailblazers of biosimilar regulation, Latin America remains a heterogeneous reality and one in which most countries are still in the process of establishing their own regulatory pathways. Countries like Colombia, which is on the cusp of publishing its guidelines, Venezuela, Peru or Ecuador have yet to reach a similar development status, while some smaller countries have yet to start making a first step in this process. The registration complexity clearly varies and is proving very dynamic but there are certainly different levels. See a table containing the current development and marketing status of biosimilar monoclonal antibodies in Latin America. Governments' conflicting priorities have in some cases facilitated or created the frameworks to expedite biosimilars entry, but this is unlikely to become a recurrent phenomenon. 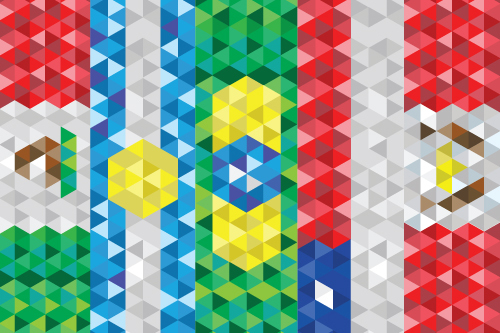 The regulatory landscape is not the only difference across different Latin American countries. An example of the complexities and peculiarities of the Latin American markets is the spectrum of openness there is to allowing access to biosimilars and the frameworks developed to allow this to happen. An example of this is the early access by as the company Probiomed with their biosimilar rituximab, Kikuzubam, which was obtained just before this regulation was in place. By contrast, successful entry and establishment of biosimilars in the Argentine market is more heavily influenced by trade related complexities. A foreign biosimilar manufacturer with an affiliate based in Argentina must export a proportional amount to make up for the importation of biosimilars into that market – ie the trade balance cannot be in favour of imports, thus creating a more favourable environment for local players. It is clear that governments in Latin America are active on the biologic landscape with diverging priorities, being these whether to ensure the highest regularoty standards, or to generate saving and expand access or to allow the creation of a national industry. From Big Pharma to local players, everyone wants their share but clinical development strategies should favour local companies for early market entry. Despite the shifting hurdles in gaining market approval described above, the Latin American biologics market presents a potentially substantial opportunity for those biosimilar players that are able to develop a lean, effective strategy in the coming years. This is evident in the level of interest shown by global, regional and local players that are already responding to this opportunity, yielding an increasingly crowded pipeline of biosimilar mAbs. Large multinational companies like Sandoz, Boehringer Ingelheim, Pfizer and MSD, are stepping into the Latin American biosimilar landscape by deploying robust clinical development programmes. Equipped with financial capabilities and a deep technical and commercial expertise, these companies are conducting multiple clinical trials across all phases of development globally. In Latin America, this includes countries like Brazil, Mexico, Argentina, Colombia, Chile and Peru. International biosimilar players are also playing their part, with perhaps less experience and with varied spectrum of clinical evidence. Closely followed in commitment, but not necessarily in experience, Latin America is witnessing the entrance of international biosimilar players possessing a diverse range of clinical evidence propositions. While there are companies like Dr Reddy's or Shanghai CP Goujian whose biosimilar products (Reditux and Etanar) have already been approved with limited supportive clinical data in poorly regulated markets, there are also companies like Celltrion whose clinical development programmes are already well advanced in the region and abroad. Most importantly, local biosimilar developers and/or manufacturers are also pursuing a stake in the market and in some cases are supported to become “local champions” in their respective countries, as is the case of Probiomed in Mexico, Bionovis and Orygen in Brazil, and Grupo Insud in Argentina. These companies have a clear regional commercial target and have hetereogeneous clinical development strategies of varying degrees of clinical robustness, to pursue this objective. Smaller local players are also expected to leverage their national market expertise to enter into commercial partnership agreements with foreign biosimilar manufacturers. Despite this increasingly crowded competitive landscape, it isn't all necessarily bad news for the established branded players. Increasingly stringent regulations are delaying entry to these markets. For example, as of February 2013, there were only three second-generation protein therapeutics approved in the major Latin American markets. In Colombia, where there are still no biosimilars regulation in place, INVIMA twice denied the approval of registration for Reditux during 2012, and in December its Review Committee recommended against the approval of Kikuzubam, attributing the decision in both cases to insufficient clinical data. In terms of speed to market, local biosimilar players will most likely gain first mover advantage in their domestic markets. Their clinical development is aimed at navigating regional standards which may provide a moderate advantage when contrasted with Big Pharma' global pathway. Additionally, they will have the urge to capitalize on their early entry momentum to compensate for levels of investment of development they are only now experiencing. Early followers are likely to be the Asian biosimilar companies and last in the market will be Big Pharma, undoubtedly armed with the strongest dossiers. In this context, it is very likely to continue witnessing partnering activities both on a global and local level. Different companies will try to leverage their existing competencies and capabilities in synergetic partnerships to achieve market entry and commercial success. Core areas of interest for partnerships are: clinical trials and regulatory processes, market access, efficient biologic manufacturing and sales and marketing. For instance, the advent of the announced partnerships between Dr Reddy's and Merck Serono, and between Samsung Bioepis and MSD may point to a potential new business model in which established Big Pharma offer their clinical development expertise to biosimilar developers who offer their better knowledge of the emerging markets. Similarly, the existent relationships between Celltrion and OliMed, and Shanghai CP Goujian and LaFrancol or EMS suggest a trend in the establishment of symbiotic relationships between Latin American companies in the need of biosimilar products developed abroad and foreign companies in the need of local expertise. Biosimilars are on the verge of creating a new type pharmaceutical market with its own dynamics and complexities. Innovator biopharmaceutical companies are being very active in developing strategies to shape where possible but in most cases to adapt to the upcoming landscape. Many of these have decided to enter in this market, others are trying to develop brand and pricing strategies to directly compete with biosimilars, other will focus on developing biobetters and probably most will pursue a combination of these. Different developing scenarios call for different tactical responses; a detailed understanding of the market is fundamental to monitor and interpret market events as they unfold, especially in light of such a fast moving, dynamic and still unknown landscape.